Join Us Saturday, October 15th 2005 on the National Mall in Washington, D.C.
DETROIT (MillionsMoreMovement.com) - A special Meeting of the Detroit City Council was called during a city council recess on August 15th to honor Minister Louis Farrakhan with a special proclamation officially endorsing the Millions More Movement in Washington DC scheduled for October 15th 2005 in commemoration of the 10th anniversary of the Million Man March. The Detroit City Council joined by Honorable Mayor Kwame Kilpatrick and Detroit Minister Dawud Muhammad, Councilmember JoAnn Watson presented Minister Farrakhan with the �Spirit of Love� award. Detroit has a predominantly Black controlled city council, school board, fire department yet the condition of Black people in Detroit is still deplorable because of the lack of unity and absence of strong and principled spiritual leadership. The Minister also pointed out that the effectiveness of spiritual leadership is based on integrity and character. The power of spiritual leaders has been undermined by those who have allowed themselves to be bought off and corrupted. He compared corruption to having a house with termites and expressed the need for a new political, spiritual and economic paradigm to move our people from being the ruled into rulership. �We cannot be carbon copies of our former slave masters and their children, and be successful in government or anything else,� said Minister Farrakhan. Minister Farrakhan then was presented the Key to the City of Detroit in an emotional presentation by Detroit Mayor Kwame Kilpatrick who said he felt �spiritually filled� after hearing Minister Farrakhan�s address to the City Council. �You not only have the key to the city, but the key to our hearts and minds as well,� said the mayor. 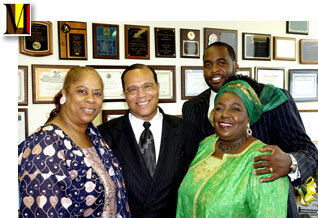 Minister Farrakhan met with Detroit spiritual leaders and activists at the Museum of African American History and is scheduled to speak on Tuesday, August 16th to an expected crowd of over 3,000 at the Fellowship Chapel of Reverend Wendell Anthony before departing to the next stop on the Millions More Movement Mobilization Tour in Indianapolis. The Millions More Movement by becoming a Registered Sponsor! Million Man March � 2005 | All Rights Reserved.